Hello love cats, if you follow me on insta, you saw me do my first live video (my apologies). I reviewed the new Maybelline Fit Me! Dewy + Smooth Foundation and the Master Prime Primer. 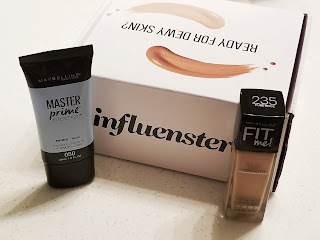 I was sent both of these from Influenster -read on to see my final thoughts! ✓ Dewy finish that lasts without a setting spray! I loved the primer, it felt super hydrating and light weight and works great with other high end foundations like FENTY! The foundation didn't cover hyper-pigmentation/scarring as much as I would have liked. I am not a fan of the type of bottle (I prefer a pump or squeeze bottle). All in all, the foundation is surprisingly good, it's not a full-coverage foundation in my opinion. Overall, not a bad product.